One night early this month I experienced a profound silence. 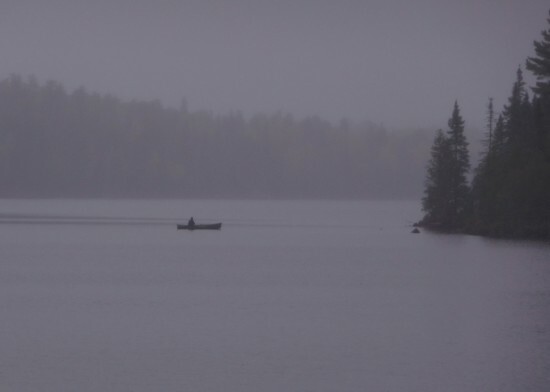 I was on a lake in the Boundary Waters Canoe Area Wilderness; the air and Earth were wet from three days of rain though it was not currently doing so. The leaves were still on the trees but you could smell the damp decay of autumn. Despite this, the lake was as quiet or quieter than it would be in winter. Silence roared in my ears, as did my heart. We first noticed the silence not longer after getting camp set up. It stopped us dead in our tracks. We stood on the rocks at water’s edge, awestruck. 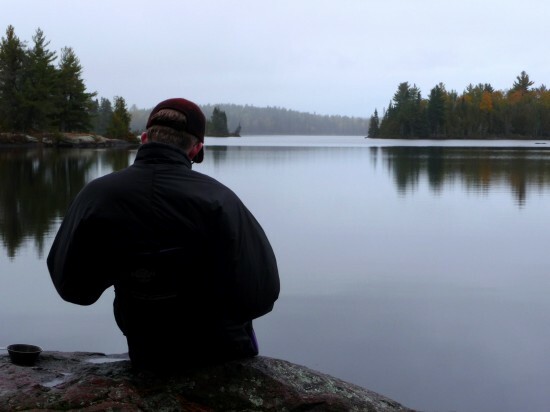 After a while, Gabe went fishing and Slim, Palmer and I stayed back at camp to read a bit, something we had not had the option of doing for the previous four days, and a favorite Boundary Waters activity for all of us. All-day rain and the long travel days such weather encouraged had meant I had only read a few pages by headlamp in the tent each night before sleep. Finally, this, the last night of the trip, an opportunity presented itself. I was starting the book I am finishing now, Jim Harrison’s astounding “The Road Home.” Yet, though I was hungry for the story, I could not help setting it down on my lap frequently, interrupted by the silence. A flock of ducks, mergansers maybe, flew over just behind where we were sitting and I could hear each bird’s wings, or so it seemed. Later, as we sat around the fire after a filling dinner, somewhat stupefied, we or just me got up several times to go stand by the lake and get struck dumb by it all over again. The stillness continued all that night and into the next morning when I got up. I was the first one out of the tent and felt cold and stiff, mentally as well as physically. I couldn’t do much besides put on almost all the clothes I had and wander around the camp. Down at the water’s edge, I heard a single duck flying over–just the wings through the air again–and when I looked up and across the lake for it, I saw that the duck was a good quarter-mile away. Out on the lake the previous evening, the short autumn day already dwindling, Gabe would occasionally pass into and out of sight a half-mile or so down the lake. He said later that every bump of the paddle against gunwale, or any other noise he made, felt like a serious violation. I read a book about “nature’s generosity and fury” that told a tale of tragic love. When I read the last paragraph of the first part it felt like I got punched in the gut and I set the book down. I wished for such silence everyday. This entry was posted in life and tagged bwcaw on Thursday, October 22, 2009 by Greg. Your writing and images never fail to move me, Greg. I know that deafening silence of late fall/early winter that you write about so well. Thank you. I felt the silence, Greg. Nice piece of writing. The photo of the canoeist is a great metaphor for life. I don’t mean that life is gloomy but that it is mysterious. Just thought I should explain that. I experienced that type of silence this past weekend. The technology and ‘busy-ness’ that I have surrounded myself with, their absence created an uncomfortable ringing in my ears, almost like an echo. I was shocked how long it took for the ringing to subside and was disappointed that it never did entirely. In my case eventually I determined that I was not experiencing complete silence. The woods were speaking their own language for anyone who cared to listen, and would have babbled on whether I had been there or not. Amicable divorce; airline food; friendly fire; non-working mother etc! .-= Tony´s last blog ..Trout distress =-.